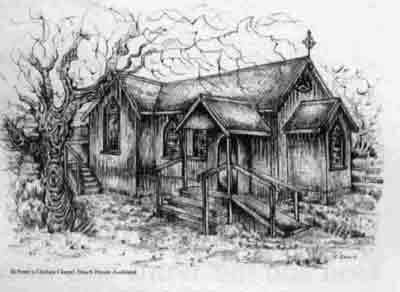 The history of Anglican ministry on the northern shores of the Waitemata Harbour began back in the 1850's with the appointment of the first Vicar of Devonport. His Parish covered a massive area, embracing the whole of the North Shore and extending northward as far as Warkworth. What a test of endurance for someone charged with the care of our pioneering worshippers in such a widely scattered community - accessible only by long and roughly-formed clay or dirt roads to be traversed either on foot or horseback. Today it is difficult to imagine what effort was entailed trudging along in the summer heat and dust, or slogging through wind, rain and mud in the winter, over such terrain. 1860 saw the establishment of the Northcote parish. A magnificent one acre block of land, overlooking Little Shoal Bay, Northcote, was consecrated on 24 June 1859 by Bishop George Augustus Selwyn, First Anglican Bishop of New Zealand, in preparation for the building of the Church of St. John the Baptist. 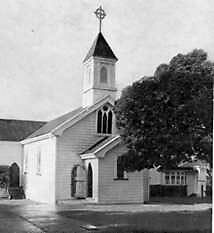 This fine church, an early Auckland example of traditional Selwyn church architecture still with us to this day, was dedicated in 1860. It is hardly surprising therefore, to find that because of proximity of St. John the Baptist Church to our neighbourhood, that Birkenhead was originally part of the Northcote parish. Birkenhead in those early pioneer days, was largely a scattered collection of timber cottages, built on small farmlets or nearby to market gardens, luscious strawberry patches and embryonic orchards - described as the "Fruitbowl of Auckland" and serviced by an irregular ferry service across the harbour. In 1881, the chairman of The Colonial Sugar Refining Company from Australia visited New Zealand, in search of a suitable site on which to build New Zealand's first and only sugar refinery. He selected for this purpose some 160 acres of farmlands, bordering on Birkenhead's southern foreshore, adjacent to Duck Creek. It was deemed that this was an ideal location with its deep water frontage for wharves and shipping, plentiful fresh water supply from Duck Creek, and ample land to build on. In June 1883, a group of Auckland businessmen in association with the Australian sugar interests, formed the first New Zealand Sugar Company, construction work was started, and Chelsea Village was born. One hundred and fifty construction workers, many of whom were married, were employed to build the refinery. They spent the first winter of 1883 mostly living in a shanty town of 60 tents and shacks, pitched along the foreshore, east of the half-built refinery. Later in September 1864, when the buildings were completed and the refining operations begun, about 100 of them stayed on as the first of the Chelsea sugar workers. In that same year of 1884, an independently run general store and a double row of 35 workers cottages were built facing one another across a wide street. In order to meet the spiritual life of this local settlement, it is recorded that the Rev. Frank George Evans - assistant minister for the parish of Holy Trinity (Devonport), first resident minister at Northcote, and also minister for St. Peter's (Takapuna), which opened early in 1884, began a Chelsea Village Sabbath School on 20 January, 1884 and Mr. F.W. Hammond was appointed as the first superintendent. Chelsea Church services were conducted regularly in 1884 under the shop verandah of the village store by Archdeacon Maunsell and the Rev. A.J. Hitchcock - successor to the Rev. F.G. Evans who resigned from the Northcote parish during April of 1884. The first baptism at Chelsea is said to have taken place on 18 May, 1884. On Sunday afternoon, 28 June 1885, a small building, the first instalment of what was then hoped would one day become a handsome church at Chelsea, was opened by Bishop Cowie. It was a fine day and the little Mission Hall named St. Peter's was crowded - about 80 people being present. The harmonium was played by Mr Bond, prayers said by the Rev. Hitchcock, and the sermon preached by Bishop Cowie. With the passage of time, most married residents of Chelsea Village gradually shifted away from the Company-owned workers cottages to set homes of their own in other parts of Birkenhead. By the early 1890's due mainly to the damp conditions of the cottages, many were unoccupied and the Village, known then as the barracks, became the haunt of single men. In 1905 the cottages were condemned by the health authorities and subsequently some were demolished, while others were sold for removal at the astounding price of £10 each. Interestingly, a few of removed cottages can still been seen even today in Mokoia and Rugby Roads. With the shifting away of the population from Chelsea to what is now Birkenhead, the continuing need for the St. Peter's Church-room no longer existed. In 1907, with the approval from the General Trust Board, St. Peter's was finally removed to its present site in Birkdale Road, where it was enlarged to serve the congregations of the Beachaven Birkdale areas. On Sunday afternoon, 29 December, 1907, at 3 pm, the re-dedication services took place at Birkdale, with St. Peter's building packed to its utmost capacity. The sermon was preached by the Ven. Archdeacon Calder, and services continued again that evening to another large congregation, conducted by the Rev. F.A. Smith - Vicar from Northcote. The collections for the day and the next Sunday were devoted to the building fund. It was of considerable interest to note that Anglican and Presbyterian bodies were to hold services in the Church on alternate Sundays. In 1908 services were commenced at Highbury, in the original Forrester's Lodge Hall - a wooden building in Hauraki (now [Hinemoa) Street - on the downhill side of where the present Birkenhead City Library stands today. The first service was taken by Mr Horace Hunt of Northcote, with a congregation of half a dozen people present. Birkenhead had at that time only three lay readers - Messrs W.F. Havill, A. Angus and W.H.Draffin. Services continued at Highbury until a meeting on 1 September 1910, resolved "That the time had arrived when the Church of England should take the steps forward of purchasing a suitable site for the subsequent erection of a Church". On 1 January 1911, the Forrester's Lodge Hall was purchased by the Church at a cost of £325. In the Church Gazettes of July/August 1911 mention is made of congregations increasing and about the promising Sunday School having a roll of 50 Scholars. The hall it was said would soon have to be transformed into a Church and extra seating provided. A new organ had also been purchased. In the early part of 1913, All Saints' Church underwent extensive enlargements and the addition of a schoolroom. On Friday 20 June 1913, All Saints' Church was re-opened for dedication by the Bishop's Commissary Archdeacon Calder. There was a large congregation present and the choir was augmented by 21 choristers from Northcote. Grateful thanks were accorded the contractor Mr W. Vincent and his co-workers for their faithful work in transforming the Hall into a Church proper - twice its original size and with a splendid Sunday School room underneath. Holy Communion was celebrated at All Saints' for the first time on 20 August, 1913. Services continued in the Church on the Highbury site until 1923, when the building was moved further down the Street to its present site. The building had to be first split into two sections - the upper floor or Church proper being removed from the Sunday School rooms underneath. Subsequently, the Sunday School room portion was re-assembled across the rear of the new site, so as the form what is now the Parish Hall, and the Church itself was repositioned in front closer to the road. The service of re-dedication of All Saints' on the new site was conducted by Archbishop Averill on Sunday 15 July 1923. The following year of 1924 was one of great importance, for it was then that Birkenhead became a separate Parochial District with our own Priest, the Rev, H. Bedford - first Vicar of Birkenhead. 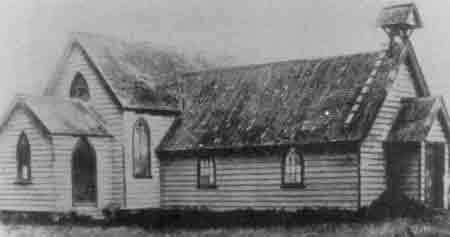 Church members living at Beach Haven met in the Home of Mrs Buer, in Puriri Road for their services and later on as attendances grew, in the Beach Haven Ratepayers Hall. 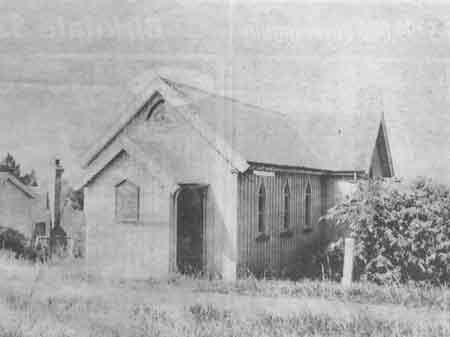 In 1964, a new Church/hall was placed on a site in Beach Haven Road, to cater for the growing need of parishioners in that area. Birkenhead Parochial District now had four churches to service and maintain with one Vicar and 5 or 6 faithful lay readers. In 1973, because of the growth of housing and population increase on this part of the North Shore, it became necessary to re-assess the total needs of Birkenhead Parochial District. The huge influx of people living in Birkdale/Beach Haven, and the new housing area of Chatswood, deemed it appropriate to create a new Birkdale/ Beach Haven Mission District centred around St. Peter's and St. Nicholas Churches, with their own clergy, etc. and leave All Saints' Church to cater for central and lower Birkenhead and the new Chatwood sub-division. Birkdale and Beach Haven got away to a good start quite soon, but growth was rather slower in the Birkenhead area. However that position is now changing considerably and we can look forward with great expectations as tred into the next 100 years of Anglican faith and worship. In 2001, the Chapel was moved again, this time to a site at 56A Tramway Road. This and was rededicated on Sunday 14th October 2001. The St Peters Church in Birkdale Road, and the St. Nicholas Church in Beach Haven Road, were both sold. The 8am services are held in the Chapel, and until other buildings are completed, all other services are held in the Beach Haven School Hall next door. One Hundred Years of Anglican Worship for Birkenhead - Author and date not known.